You are browsing the archive for cartoon books. "Tell me about your Big Society ..."
Hard Times, a new exhibition by the Times cartoonist Peter Brookes, opens at the Chris Beetles Gallery in St James’s, London, today and runs until November 5. The selling show features more than 120 of Brookes’ most recent editorial cartoons from The Times, and ties in with the launch of his new book, also called Hard Times. Private Eye celebrates its 50th birthday next month and appears to be in rude health, bucking the downward trend for magazine circulation in the digital age. The anniversary is October 25 but the celebrations start on Tuesday (September 20) with the release of a new book Private Eye: The First 50 Years, a history of the magazine written by the Eye journalist Adam Macqueen that charts its rise from 300 copies of the first edition in 1961, below, to a fortnightly circulation of more than 200,000. The book features interviews with key players in the Private Eye story, rare archive material and unseen photos. (There are some “seen” ones too.) And, of course, there is an abundance of the cartoons that are so central to appeal of the magazine. You can see more of those, including many by members of the PCO, which runs The Bloghorn, when the famously anti-establishment magazine puts on a First 50 Years exhibition at the very establishment Victoria and Albert Museum [Shurely shome mishtake? – Ed]. It opens at the V&A on October 18 and runs until January 8. Cartoons will be shown in themed sections, on politics, royalty and social observation, and there will be gags, long-running strips and caricatures. The Bloghorn will have more on the exhibition nearer the time. You can read more on how marvellous they are in a Media Guardian article this week and even Vanity Fair is on the case with a piece by Christopher Hitchens. Updates on the 50th anniversary celebrations will appear on the Private Eye at 50 blog. Whenever the media spotlight is turned on cartoons it is often those of a political variety. These cartoons shout the loudest and have news impact. But Bloghorn writer Royston Robertson thinks it’s time to speak up for its more modest cousin: the gag cartoon. I once heard the writer Will Self describe gags as “the haiku of cartoons”. That may sound a little pretentious (from Will Self? Surely not?) but I think it’s true. A gag cartoon is like a poem. Or a one-liner joke, perhaps. It is a small, carefully crafted article. It doesn’t have the grandeur or the, let’s be honest, occasional self-importance of the political cartoon, but it is still designed to provoke a reaction: hopefully laughter. I have heard some claim that the gag cartoon is in some way an old-fashioned form. This is probably because it is so closely connected with magazines, so people think of crumpled, yellowing copies of Punch in the dentist’s waiting room. Plus, magazines and newspapers are “dead-tree technology”, and that, we are constantly being told, is on the way out. But, when you think about it, the gag cartoon is actually perfectly suited for this age of the short attention-span and sits just as easily on a web page, or an iPad app, as a magazine page. And long may it continue to do so. A book of cartoons from The Oldie is to be published later this month, and an exhibition to go with it will be held at the Cartoon Museum in London. The Oldie Book of Cartoons 1992-2009, published on September 25, will feature more than 400 of the best cartoons from the irreverent magazine. The Cartoon Museum, in Little Russell Street, Bloomsbury, will hold an exhibition entitled Cartoons from The Oldie in its Blue Room from September 30 until December 24. The latest edition of the magazine comes with a mini book which will act as a taster. 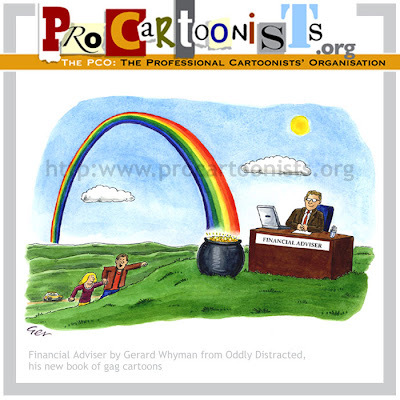 More magazine news: Bernie is the new Cartoonist of the Month at Prospect magazine. He reveals that he usually never tells people he’s a cartoonist, because “they suggest ideas for cartoons like ‘Caution, large plant crossing’. I find it’s best to keep quiet”. Cartoon market stall? They're 'avin a larf! Most cartoonists have wondered how they can bypass traditional publication and get their work direct to a paying audience, particularly if they have ever seen rejected drawings and jokes appreciated by the general public. PCOer Clive Goddard has joined forces with cartoon-merchandise producer Steve Willis to come up with an ingenious solution: a cartoon market stall. The pair are now set to offer free space, for a commission, to a caricaturist sitting adjacent to the stall, as there are always plenty of tourists seeing the sights of Oxford passing by. Bloghorn wonders how long it can be before we see a cartoon market stall on EastEnders. It would cheer up Albert Square no end. PCOer Alex Matthews has published a book of cartoons with the rather unlikely title of Crystalline Structure Friday. It brings together dozens of single-panel “Alexander” cartoons from magazines such as Private Eye and Prospect, along with previously unseen work. Bloghorn is amused by Alex’s twisted and surreal view of the world, so we cornered him and asked him some questions. You’re relatively new to the world of magazine cartooning, why did you decide to do a compilation of cartoons at this stage? I felt that the first stage of my cartooning career, where I was learning how to write gags, developing a style, and trying desperately to get my first cartoon published, was over. I also had a lot of good gags that had never seen print, so I stuck the best ones in there. It’s a really good thing to be able to give potential clients a book of your work. Better than scribbling down a website address. They’ll remember you. I wanted a title that would make people go “What?” And then, when they’ve read the cartoon that the title is taken from, they get it. And are perhaps a little disappointed. It fits with the black cover and general feel of the book, I think. As well as being a cartoonist, you teach art and design in Moscow. How do those two things complement each other? Teaching keeps my mind lively and explaining ideas about illustration helps them to become clearer in my mind. And because my Russian is so bad, I am more isolated than in England. That actually helps in thinking up ideas. I’m less distracted by other people, TV and things. People say Russia must give you so many ideas, but it doesn’t really. My gags are more about having job interviews with pelicans and stuff like that. 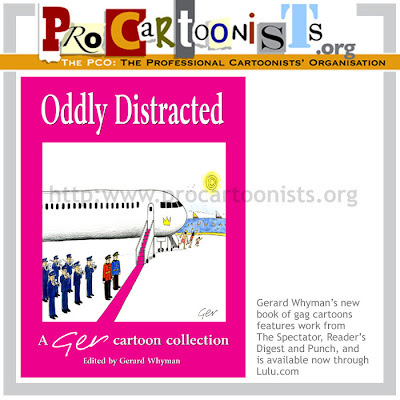 This month sees my publishing debut: a 112-page cartoon compilation book entitled Oddly Distracted – a collection of nearly 190 cartoons of my best published and unpublished work. The book was edited, designed, produced and published entirely by myself using a PC and Lulu.com, the world’s largest self-publishing website. I hadn’t realised until recently that next year marks my 15th year in the cartooning business – being first published in 1994 – and so this book is a timely marker of that fact. Not that it was the prime motivator – I was inspired by seeing Tim Harries’ excellent self-published cartoon books last year and decided to have a go myself. Another factor was that Tim gave me free copies of his book with the promise that I give him one of mine when it was done. Twelve months on and I’ve managed to keep my side of the bargain. Lulu is a “print-on-demand” service which means that books are only printed when ordered. The beauty of this system is that there is no minimum print run – you can just have one copy of book if you wish. So, with no storage costs, the process is cheap; there are no set up costs and the only investment is your time and energy. You must, however, be computer literate to be able to produce a printable book. I bought an optional distribution deal with Lulu for £79.95 which gave me an ISBN number and the availability of my book to online stores like Amazon which opens up a huge market. The process of creating the book turned out to be a bit tricky and frustrating at times. Figuring out the software to lay out the pages was one thing – it took a while to master the Page Plus package – but using Lulu’s rather complex website was quite another. It doesn’t help if you’re like me and wade straight in without reading the small print closely. One error was to initially make the book 7.5”x 7.5” square, a size ineligible for the distribution deal I had bought with them. So I had to start from scratch and redesigned the book to a crown quarto format. The cartoon pages are loosely themed – there are ones on couples with troubles, business, and entertainment, among many other topics. There is work that has been published in The Spectator, The Oldie and Reader’s Digest and there are several full page cartoons that were originally printed in Punch. There is also a large contingent of my favourite unpublished gags. I’m very pleased with the way has book has finally turned out. The print quality is first class and really does justice to the original drawings. Of course, the hardest part now is to convince the buying public to part with their hard-earned cash for my product – not easy in these difficult times.